The Prochem Fibre Shampoo is a professional high foam crystalising shampoo with new micro-encapsulation formula, for carpet rotary and dry foam cleaning. Prochem Fibre Shampoo contains a buffered pH system to help prevent 'browning' and colour bleed and can also be used in conjunction with Prochem 'problem solver' additives. Clear liquid with lemon and lime fragrance. A specially formulated acidic corrective agent for the direct spray treatment of jute cellulosic browning, yellowing, tea, coffee and tannin stains on carpets and fabrics. 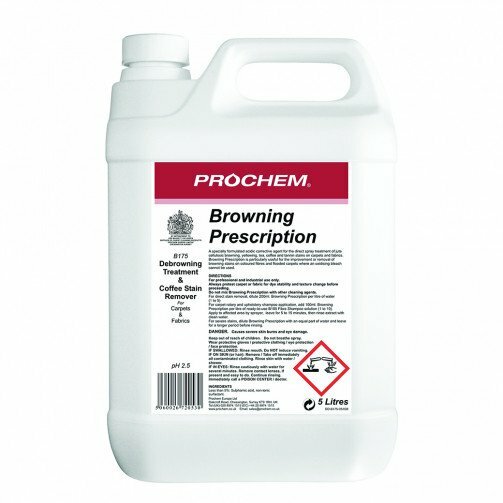 Browning Prescription is particularly useful for the improvement or removal of browning stains on coloured fibres and flooded carpets where an oxidising bleach cannot be used. Formulated for treating jute browning and large areas of water damage staining on carpets. Also suitable for tea and coffee stain removal on large areas of carpet. Contains anti-browning and anti-yellowing agents. Can be added to B105 Fibre Shampoo for rotary brush application, then extracted with clean water. For professional and industrial use only. Always pretest carpet or fabric for dye stability and texture change before proceeding. 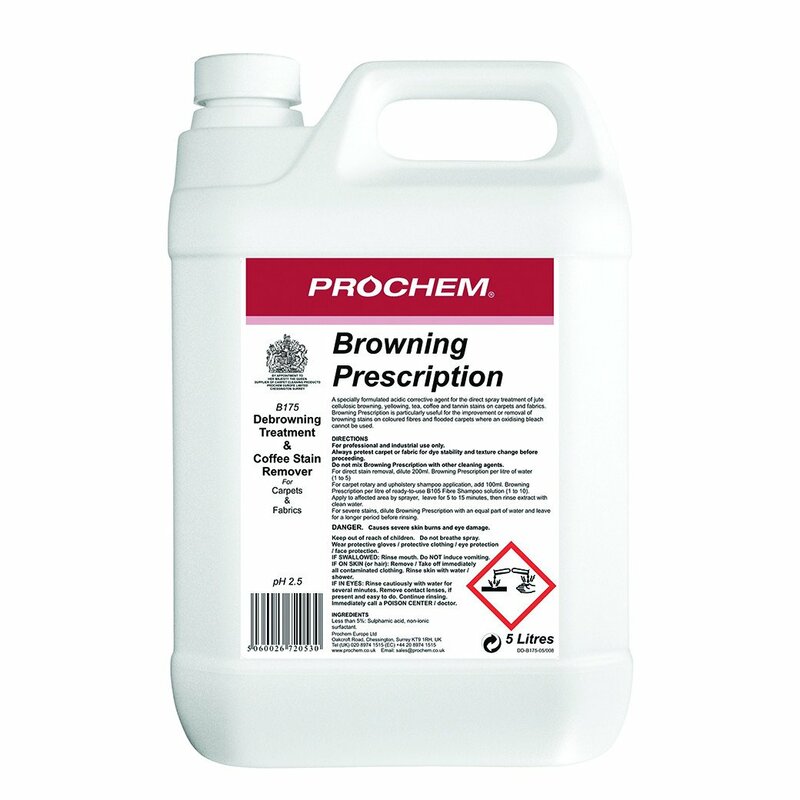 Do not mix Browning Prescription with other cleaning agents. For direct stain removal, mix 200ml Browning Prescription per litre of water (1 to 5). For carpet rotary and upholstery shampoo application, add 100ml. Browning Prescription per litre of ready-to-use B105 Fibre Shampoo solution (1 to 10). Apply to affected area by sprayer, leave for 5 to 15 minutes, then rinse extract with clean water. For severe stains, dilute Browning Prescription with an equal part of water and leave for a longer period before rinsing.